Dungeon Master is one of the games that have had the biggest impact on me. I’ll never forget when I faced my first zombie. It was behind bars, I had a dagger, and to my joy throwing the dagger at the zombie through the bars actually worked! Immediately I knew this game was something special. Dungeon Master was a revolutionary CRPG featuring a pseudo-3D world presented in first-person perspective. Players controlled a party of four characters that acted as a single “blob” (hence the term “blobber”), moving in real time from square to square. Controlling four characters in real time may sound like a daunting task, but the game is fairly slow and all actions take a certain time to execute, with the various types of attacks having different speeds, so there is no frenetic clicking involved. 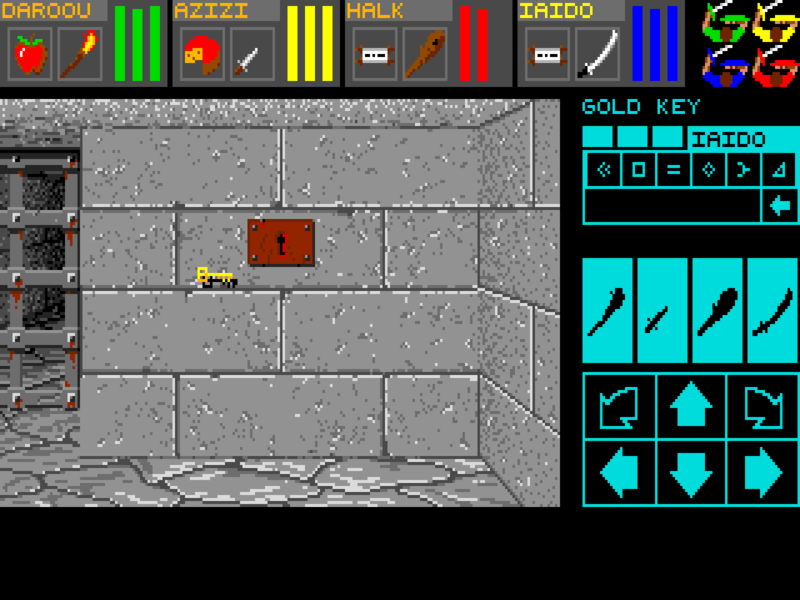 The combat is the weakest aspect of the game, since it’s too easy to side step enemies, attack them, and side step again – the infamous Two Step Dance – but that is a general problem with all real-time first person party- and tile-based RPGs – aka “blobbers”.Apart from the combat, however, Dungeon Master was a step forward to RPGs in most respects. The audiovisuals were unrivaled for a long time. 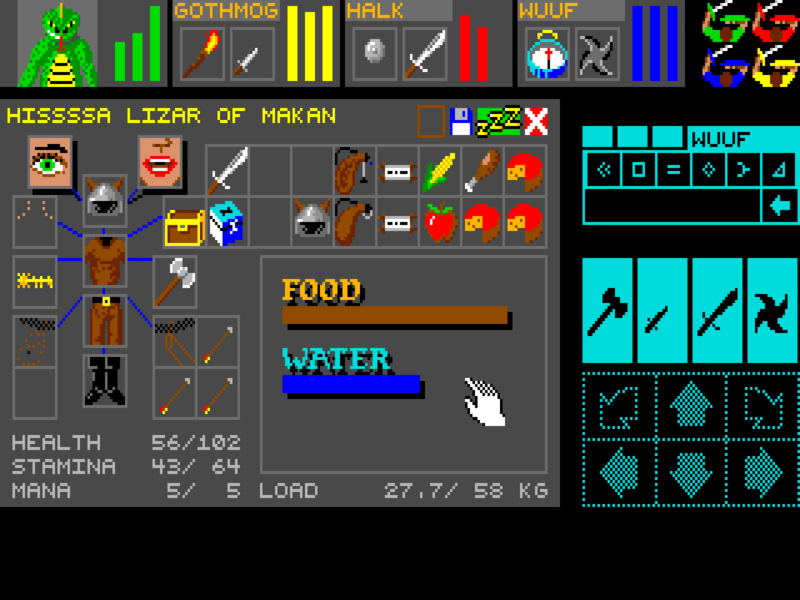 DM was one of the first games to use 3D audio, so you could actually use sound to keep track of your enemies. And while there’s only one type of dungeon graphics throughout the game, it looked very good. Dungeon Master was also one of the first CRPGs to discard the traditional XP system, and instead used a system where skills increased by usage, something later adopted by the Elder Scrolls games. The game did have the traditional character classes of Fighter, Priest, Wizard and Ninja, and characters could advance in all classes. Using melee weapons increased Fighter levels, missiles weapons and generally throwing things increased Ninja levels, casting spells increased Wizard levels, while making potions increased Priest levels. You didn’t create your own characters, but instead had to choose up to four heroes from The Hall of Champions. And what a colorful and diverse lot those champions were! Who can forget characters like Hisssssa, Wuuf the Bika or Halk the Barbarian? Dungeon Master featured a wide assortment of enemies, from skeletons and zombies, to shrieking slow moving trees, to giant rats, scorpions and purple worms. And the most annoying creature of them all – the gigglers, who would run up to the party, steal an item, giggle and run away. There wasn’t really much of story in the game, but the manual included a well-written back-story to introduce players into the game. It tells that one day the Grey Lord found a Power Gem, but unleashing its power resulted in his essence splitting into two halves – a good wizard and the evil Lord Chaos. The player takes the role of Theron, Lord Grey’s apprentice, who selects and controls the four champions. The task is to enter the dungeon, find the Firestaff and then use it to stop Lord Chaos. DM was followed by Chaos Strikes Back (1989), at first advertised as an expansion, but then released as a stand-alone game. It allowed you to import your characters from DM and also came with a Champion Editor tool, which allowed players to customize the Champions names and portraits – pixel by pixel. Chaos Strikes Back was like Dungeon Master on steroids, with even more deadly enemies, fiendish puzzles and possibly the most intricate 3D dungeon ever created, with all 13 levels interconnected via numerous stair and pits. In my opinion it was the ultimate game in the real-time blobber sub-genre of CRPGs. One of my best gaming moments ever was on a level containing both illusory walls and dragons. Unlike me, the dragons could see through the walls, and even breath fire through them. But I could hear each dragon stomping about, which meant I could locate them by sound and then do the “Two Step Dance” though the illusory walls! Later RPGs would have prettier and more varied graphics, and have more of a story and better NPC interaction, but none could rival the level design and puzzles of Dungeon Master and Chaos Strikes Back. Another thing that set DM and CSB apart from later games is the interaction with the environment, from using doors and traps, to chopping and fireballing doors, to something as basic as throwing things through bars. For example, in DM a Fireball actually has a physical presence in the dungeon and can burn wooden doors or be sent through teleporters.